Notes on wetted surface area (WSA). "I wrote these notes because I have seen on several sites various questions about WSA and the effect on speed, which has more WSA – a catamaran or a monohull, plus several other queries and they are all answered here." 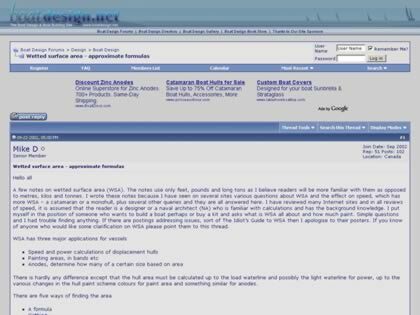 Web Site Snapshot: If available, above is a snapshot of the Wetted surface area web site at http://forums.boatdesign.net/showthread.php?threadid=930 as it appeared when this site was added to the directory or last verified. Please Note that Boat Design Net has no involvement with the above web site; all content and images depicted in the above thumbnail are the property and copyright of Wetted surface area unless otherwise noted on that site. Description: Notes on wetted surface area (WSA). "I wrote these notes because I have seen on several sites various questions about WSA and the effect on speed, which has more WSA – a catamaran or a monohull, plus several other queries and they are all answered here."